In the Summer of 2015 I was sponsored by the NSF East Asia and Pacific Summer Institutes Fellowship program (EAPSI) to visit the Institute of Vertebrate Paleontology and Paleoanthropology (IVPP) (中国科学院古脊椎动物与古人类研究所) in Beijing, China. I spent the summer looking through screen-washed sediment from southern Chinese caves (in Guangxi, 广西). I'm interested in the fossil reptiles and amphibians from these caves because the deposits are from the Pleistocene, also known as the Ice Ages, and can tell us a lot about previous climate changes. This project is a continuation of the growing ties between East Tennessee State University (ETSU) and IVPP. I was the third ETSU student to visit IVPP through this NSF program, and the paleontology professors at ETSU have ongoing projects with their Chinese counterparts. In addition to fostering international collaboration, this partnership is invaluable in the study of the fossils from the Gray Fossil Site, as many of the fossil plants and animals found there are only found in Asia today. ​Numerous herpetological remains from Pleistocene caves of Guangxi Zhuang Autonomous Region, China, were recovered and are under investigation. Mead, J. I., Moscato, D., Wang, Y., Jin, C., & Yan, Y. (2014). Pleistocene lizards (Squamata, Reptilia) from the karst caves in Chongzuo, Guangxi, southern China. Quaternary International, 354, 94-99. A heap of bones recovered from one of the caves. There are 'herps' in there somewhere! On our days off, the other Beijing "EAPSI-ers" and I took in the sights. 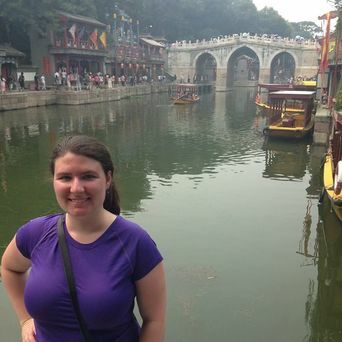 One of our last trips was to the Summer Palace. Get an inside glimpse of the IVPP in David Attenborough's documentary Rise of Animals: Triumph of the Vertebrates, where many Chinese fossils are highlighted. The documentary airs on the Smithsonian Channel. ​This material is based upon work supported by the National Science Foundation under Grant No. 1515243.